At Cliff Kapson Consulting, Inc., we have over 20 years of experience as a residential and commercial property inspector. 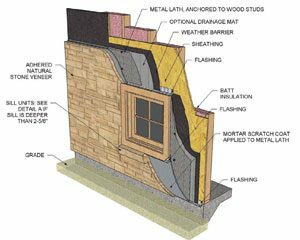 We specialize in the inspections and evaluations of exterior building envelopes or claddings including Stone, EIFS or Dryvit, Brick and Composite Board siding, and more. Our clients vary from individual homeowners to large corporations. We take a great sense of pride when providing our reports. They are the most comprehensive and detailed inspection and reports available anywhere. In doing so, we provide our clients with crucial information regarding the next steps that need to be taken if necessary. For more information on our residential and commercial property inspections or if your organization is in need of a commercial property inspector, call the inspection experts of Cliff Kapson today at 888-304-3437. You can also fill out the contact form located on this page and one of our professional associates will get back to you as soon as possible. If you have any questions about commercial property inspections or would like more information regarding our residential property inspection and evaluation services, call us today at 888-304-3437. Or fill out the contact form on this page and we will get back to you shortly.